Provides a technology overview of what goes into a high performance loudspeaker and covers all the latest advances in the field The design of high performance loudspeakers requires a mix of developed skills in electroacoustics, high fidelity sound reproduction and subjective evaluation. 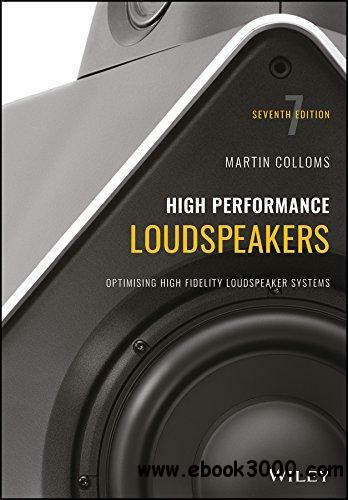 Taking a designer's view of the subject, this new edition of High Performance Loudspeakers, Seventh Edition provides a comprehensive, timely and practical knowledge base to aid the design of superior loudspeaker systems fit for purpose. It is updated throughout with the latest progress in research and technology, synthesis and analysis, digital signal processing incorporated products, automated production test systems and wireless compact designs. This Seventh Edition of the highly successful guide to the design and specifications of high quality loudspeakers and loudspeaker systems addresses the issue of where higher performance and sound quality is required and shows how the numerous considerations - including application, target price, size, aspiration and particular market - lead to a complex mix of design and engineering decisions. The book has also been substantially revised to reflect the many changes in the technology of loudspeakers and includes two brand new chapters - one covering ultra-compact systems and DSP integration, and the second providing details of a worked example of the loudspeaker systems design process. Offers a complete overview of the technology Thoroughly updated with new content to reflect the latest advances in the field while retaining the firm theoretical foundation of previous editions Presents a designer's point of view of the field, helping to equip both amateur enthusiasts and academically trained graduates with industry practice Covers all the newest developments in the field of high performance loudspeakers Offers a critical and objective approach to all subjects covered, rather than a simple spelling out of theory and facts Appeals to both amateur speaker builders as a source of ideas, and to professional speaker designers with an overview of competitive products and features Acknowledged industry-wide as the definitive work on speaker design and analysis, High Performance Loudspeakers, Seventh Edition is essential reading for audio engineers, speaker designers, equipment designers and students of acoustic engineering, electronics and electro-acoustics. It will also prove invaluable to students of electronics, broadcasting and recording techniques, but will also be of interest to authors and journalists in audio, and not least, amateur loudspeaker builders and enthusiasts.